Strengthens gums, prevents bleeding, gingivitis and bad breath. Increases saliva production and prevents dry mouth. 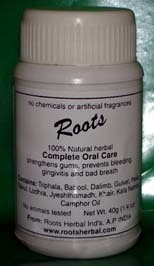 Contains: Triphala, Babool, Dalimb, Gulvel, Peelu, Bakul, Lodhra, Jyeshthamadh, Khair, Kala Namak and Camphor Oil. Usage: Take a pinch, massage gums and rub teeth with fingertip for 3 minutes and rinse. Use twice daily preferably after meals.